Comes in assorted patterns but you can pick the main color. Geeta Hippie clothes. Geeta Bohemian clothing. Artsy clothing for expressive women! Since 1972 Geeta of India has lead the way in creating classic gypsy hippie chick bohemian shabby chic styles for women and juniors. Handmade boutique styles at affordable prices. 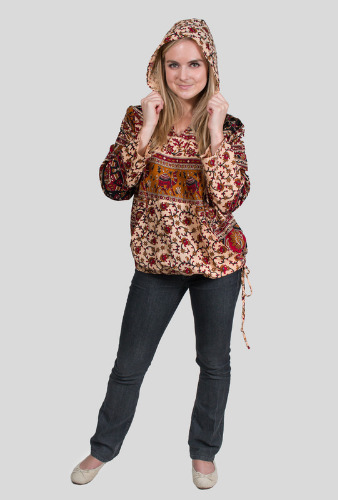 100% cotton peasant pullover baja hoodie top with belly pocket in front and ties at neckline. Drawstring at hemline allows you to cinch the hemline for a perfect fit. This hoodie is made of the same fabric the GEETA wrap skirts are made of. The patterns can vary a bit. Assorted beautiful ethnic patterns. Authentic 70's style. Because of the handmade nature of these garments, sizing varies. The measurements here represent an average measure of this garment. Bust measurements are taken with the garment stretched. Ethnic patterns might not match the picture exactly as each item is sewn by hand. Check the measurements below.